All images in print-quality. If you require other formats or images please don't hesitate to contact us. Goeppingen, Germany, April 4, 2016 - TeamViewer, the global pioneer of remote control and online collaboration software, is pleased to announce the appointment of Felix Mann as new Head of Corporate Communications. Mann will maintain and continue to develop the company’s profile, while driving national and international media relations and fostering a more cohesive internal communications. 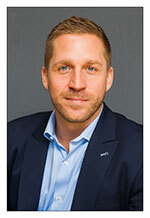 Felix Mann brings extensive corporate communications knowledge for his new role. He has more than 10 years of experience in leading communication functions in various businesses. Felix Mann has worked in various leading corporate communications positions in the financial industry. Before joining TeamViewer, he was Head of Marketing & Communications for Germany, Austria, Switzerland and the Nordics at State Street Bank. In this role, he also actively promoted the digitalization strategy of the US financial institution in Central Europe. Felix Mann holds a diploma in Politics from the Freie Universitaet Berlin and is a graduate of the Kellogg-WHU Executive MBA Program from the Otto Beisheim School of Management. Founded in 2005, TeamViewer is fully focused on the development and distribution of high-end solutions for online communication, collaboration and remote monitoring of IT systems. Available in over 30 languages and with more than 200 million users worldwide, TeamViewer is one of the world’s most popular providers of remote control and online meeting software. airbackup, a powerful cloud-based backup solution, and ITbrain, a valuable remote monitoring, anti-malware and IT asset tracking solution, complement TeamViewer’s product portfolio. Follow us on Twitter at @TeamViewer and on our blog at blog.teamviewer.com.